I’ve been surfing in speedos – click here to read about the first time I did that (warning… I did end up getting fucked in the dunes afterwards). But, I have never played tennis in a speedo, I think it would be fun and would be great for my speedo tan during summer but alas, speedos aren’t really that acceptable just yet. 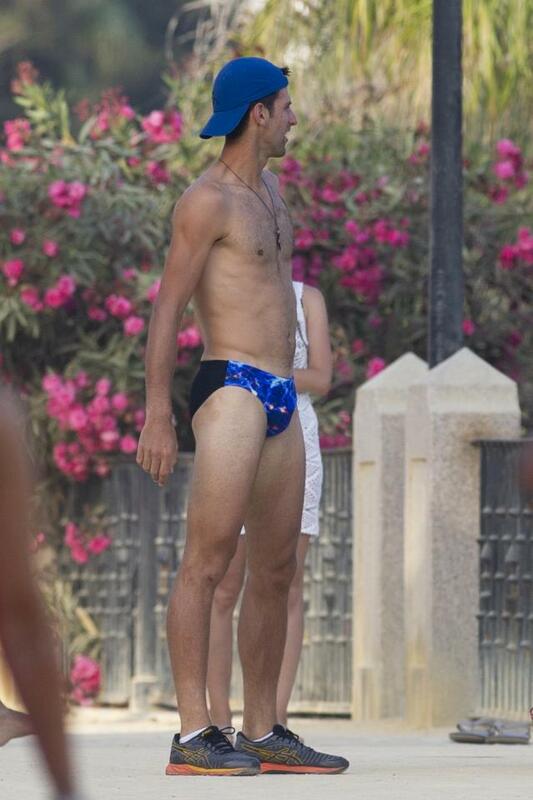 Here are some candid celebrity shots of Novak Djokovic speedo’ing it up in Spain. I wonder if speedos are more acceptable in Spain? I have no idea since I’ve never been to mainland Europe. Anyone want to invite me this northern hemisphere summer? This entry was posted in Str8 Photos and tagged celeb, celebrity, celebrity speedo, guys photos, Novak Djokovic, speedo, speedo photos, speedos, tennis by Bisexual Dave. Bookmark the permalink. You need to check out Stefanos Tsitsipas… Cool guy & I’d love to see him in a Speedo…or naked!